Kimball Farms Nursing Care Center is committed to delivering high-quality care. Named a US News & World Report Best Nursing Home for the second year in a row, Kimball Farms Nursing Care Center is accredited by The Joint Commission with the Gold Seal of Approval™ and has earned four deficiency-free state surveys during annual Department of Health inspections. In 2017, Kimball Farms Nursing Care Center was named among the best in the state by US News & World Report for the second year in a row. Of more than 15,000 skilled nursing facilities nationwide evaluated, nearly 2,300 nursing homes earned the designation as a US News 2017-2018 Best Nursing Home. Only 75 facilities in Massachusetts achieved this recognition. In 2016, positive feedback on National Research Corporation’s My InnerView survey placed Kimball Farms Nursing Care Center in the top 7% in the nation for customer satisfaction for the seventh year in a row. In 2015, positive feedback on National Research Corporation’s My InnerView survey placed Kimball Farms Nursing Care Center in the top 5% in the nation for employee satisfaction for the sixth year in a row. National Research Corporation’s 2016-2017 “Excellence in Action” award for Customer Satisfaction, ranking Kimball Farms Nursing Care Center among the top 10 percent nationally with respect to how highly residents and family members would recommend to others for the ninth year in a row. 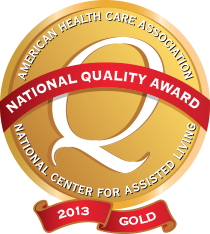 Gold Quality Award – Kimball Farms Nursing Care Center is one of only five centers in the country to earn a 2013 Gold-Excellence in Quality National Quality Award from the American Health Care Association and the National Center for Assisted Living. This recognizes Kimball Farms as a model of excellence in long-term care. Kimball Farms Nursing Care Center joins our sister center, Linda Manor Extended Care Facility, in earning this honor, representing two of the five total Award recipients nationwide in 2013. The AHCA/NCAL National Quality Award is a progressive three-step process that encourages continuous learning and development of integrated quality systems to achieve performance excellence. Each progressive step requires a more detailed and comprehensive demonstration of quality integration and performance. The criteria for each step is based on the Baldrige Performance Excellence Program’s core values and concepts. The Gold – Excellence in Quality award recognizes best practices in leadership, strategic planning, customer focus, process management and results. Only 28 care centers have achieved this level of quality recognition since the program began in 1996. CARF-CCAC awarded the Five-Year term of accreditation to Kimball Farms Life Care Community, PineHill Assisted Living Community and Kimball Farms Nursing Care Center. CARF International is recognized as the industry standard for health and human services service providers. Accreditation demonstrates that Kimball Farms has made a specific commitment to put the needs of our residents at the center of everything we do. Kimball Farms is one of only a half-dozen senior living and long-term care providers in Massachusetts to earn this exclusive recognition. Five-year accreditation for a first time applicant is uncommon, making Kimball Farms’ achievement that much more noteworthy.